When it comes to landing a robot on another planet, perhaps the most important question is where to put the dang thing. The researchers behind the upcoming ExoMars mission, consisting of a rover and lander, have now announced their preferred location on the Red Planet. After several years of discussion, the scientists selected Oxia Planum as the optimal site, according to an announcement a meeting at the National Space Centre in Leicester, UK. Though subject to further review, this location could be a prime spot to determine whether life ever existed on Mars. “We can fulfill the mission objectives there and the trafficability is very good—the rover will be able to drive,” Veronique Dehant, principle investigator on the surface platform’s Lander radio-science experiment from the Royal Observatory Belgium, told Gizmodo. ExoMars 2020 is the next part of the ExoMars missions: a rover and landing platform that will be sent to Mars as part of a joint mission between the European Space Agency and Russia’s Roscosmos. The rover and platform consist of instruments for measuring the planet’s dirt and atmosphere, and will separate just before landing. The mission’s main goal is to find evidence of organic molecules deep in the Martian dirt, and perhaps biosignatures, chemical signs of life. Given that Mars has about as much land as the Earth does above water, picking a site has been a long process, according to an ESA fact sheet. Such a site must be interesting scientifically, with signs of a wet past. It must also be in a low-lying area to maximize the amount of atmosphere available, in order to slow down the descending payload with its rockets and parachutes. And it has to be flat enough to land safely and for a rover to navigate. Oxia Planum sits just north of Mars’ equator. Channels cutting through its clay are signs of past waterways and a potential reservoir of organic molecules. The selection follows a five-year process that began with an organized working group, then a call for nominations. The team narrowed their options to two sites, Oxia Planum and Mawrth Vallis further north. While both were interesting scientifically and the Mawrth Vallis had slightly more diverse geology, Oxia Planum won, being the more navigable site at a lower elevation. Mission scientists can’t pinpoint an exact location for the landing—instead, they create an ellipse which serves as a target for the landing components. The ellipse is relatively obstacle free, spare one crater in its corner, and is approximately the size of Rhode Island. The odds of landing in the one crater are relatively slim, said Dehant. There’s more to a successful landing than just picking a good spot, of course—the descent needs to go as planned. Back in 2016, the ExoMars Schiaparell lander crashed due to an error in its onboard computer. Picking a landing site determines what kind of science a rover might be expected to conduct. 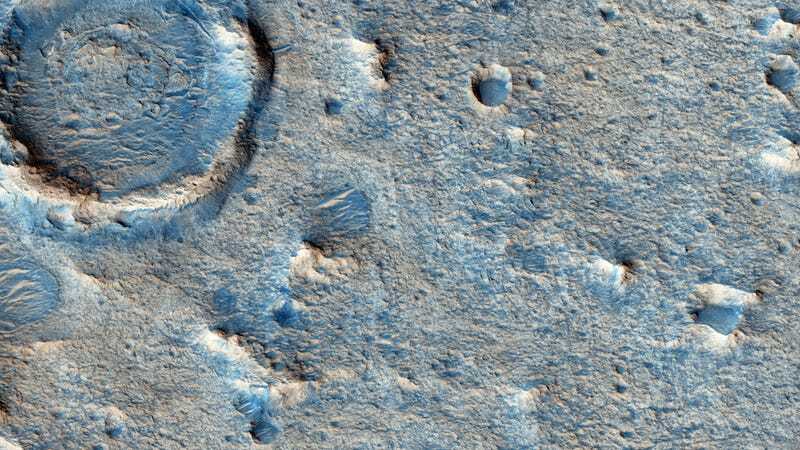 Oxia Planum isn’t much different from Gale Crater, the presumed ancient lakebed that is currently home to NASA’s Curiosity rover, in terms of the kind of scientific discovery it offers, Dehant explained to Gizmodo. But she hopes that Oxia Planum will be a fruitful place to search for biosignatures. The rover’s experiments won’t only look at the dirt, though—there will be a suite of instruments to study the planet’s climate and atmosphere. After all, not only have recent results from Curiosity found organic molecules on the planet, but also a strange seasonal variation to its atmospheric methane. Scientists interested in the Martian atmosphere perhaps have fewer requirements for where the mission lands. They just need the experiment to arrive in working order.